When it comes to wildlife safaris in India, you’d be amazed by the variety and abundance of the flora and fauna. Gone are the times when the maharajas of India proudly hunted and displayed the tigers and lions in their palaces to flaunt their prowess. After decades of reckless hunting, and concerns by the authorities - thanks to the British Raj - guidelines for conservation of wild animals and their habitat were put into place. With 160+ National Parks, wildlife safaris in India are indeed thrilling and adventurous experiences. With the jungles teeming with wildlife that include the endangered species like Great Single Horned Rhinos, Asiatic Lions and Royal Bengal Tigers and with great infrastructure in form of luxury tents, jungle lodges and budget accommodation, a wildlife safari is one of the you-cannot-miss-it things to do in India. One of the most renowned national parks in India, Ranthambore National Park in Rajasthan’s Sawai Madhopur used to be the former hunting ground of Kachwaha Rajputs, the maharajas of Jaipur. This wildlife reserve is named after the legendary Ranthambore Fort which was recently inscribed as one of the UNESCO World Heritage Hill Forts of Rajathan. 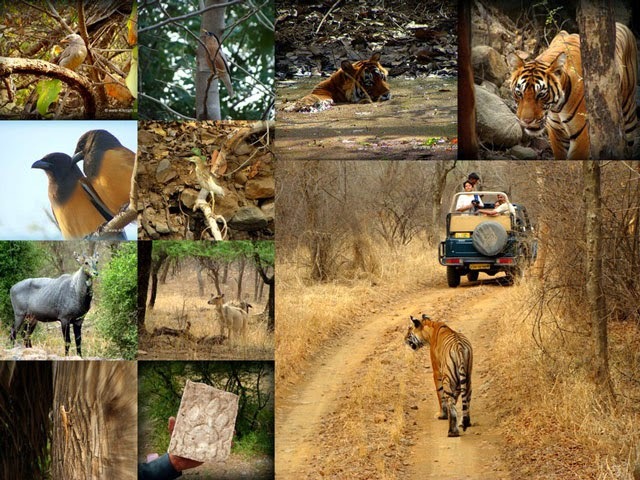 It is believed that Ranthambore offers the maximum probability of spotting the Royal Bengal Tigers in their natural habitat owing to its unique vegetation and grassland which is the dry deciduous forest. One of the premier reserves under the Project Tiger, Ranthambore is also home to mammals such as leopard, hyena, wild boar, sambar and sloth bear. 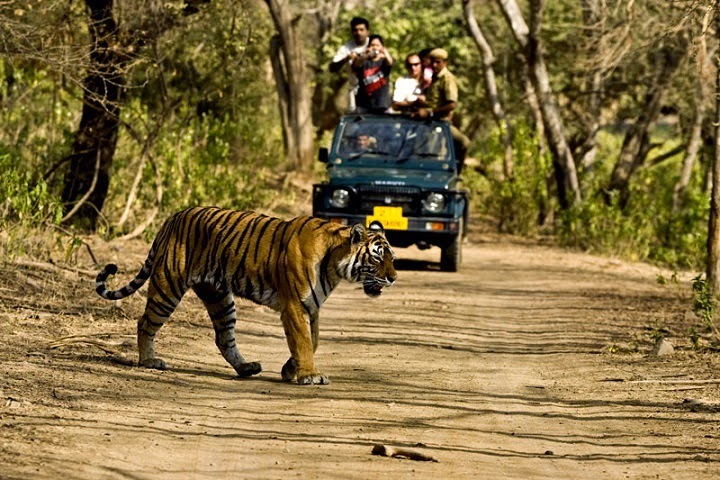 The best time to visit Ranthambore for tiger spotting is from March till June. The reserve remains closed to visitors during monsoon from the month of July till September. One of the best places to visit in Gujarat, the last abode of the Asiatic Lion, Sasan Gir National Park is one of the finest wildlife reserves in central India and offers the most unique experience of wildlife safari in India. Located in the state of Gujarat in Junagarh District, Sasan Gir National Park was established in 1965 and spread across the total area of 1412 sq. km. Gir is home to over 35 species of mammals that include the Asiatic Lions, Hyenas, Golden Jackals, Leopards, Sloth Bears, Nilgai, Antelopes, Chinakaras and Blackbucks. Gir National Park is also renowned for the population of crocodiles as well as over 200 species of birds. The best time to visit this forest reserve. Gir National Park is also renowned for its Maldhari population, a community of humans who have lived here for generations. They sustain themselves on the harvests from forest and their livestock. Any kill that Lions make of their livestock is considered to be the offering in exchange of their living in the homeland of the predators. The entry fees to this forest reserve with maximum 6 occupants per vehicle for Indians comes to Rs. 400/- on weekdays, INR 500 on weekends and INR 600 on national and state holidays whereas the entrance charges for foreign nationals is US$40 (that must be paid in rupees). The former hunting ground of the maharajas of Mysore, Bandipur National Park is located in the state of Karnataka in South India and happens to be a part of the World Heritage Nilgiri Biosphere Reserve. With home to more than 100 species of mammals and 350 species of bird, Bandipur National Park is one of the best places to head for wildlife safaris in India especially when it comes to South India. This wildlife reserve is comfortably accessible from Ooty and Bangalore. Daily safaris are allowed twice into the park and managed by government. The approx all inclusive cost for 2 hours morning or evening safari in Bandipur is around INR 2000. The park could be visited throughout the year but the best time to see tigers are the hotter month of May and June. A UNESCO inscribed World Heritage Site; Kaziranga National Park in Assam is home to the 2/3rd of the world’s Great Single Horned Rhinoceros population. Kaziranga Nataional Park also happens to be the protected area having the highest density of tigers in the world. Besides the famed single-horned rhinos, Kaziranga is home to mammals such as tigers, elephants, swamp deer, water buffalo, wild boar, bog deer, Indian fox, Jackals and leopard. This wildlife reserve in North East India is also home to over 100 species of birds and is recognized as an “Important Bird Area” by the Birdlife International. More than 15 endangered species live in Kaziranga National Park. Considered the best tiger reserve in India when it comes to the probability of spotting tigers, Bandhavgarh National Park in Madhya Pradesh is one of the finest national parks in India. This wildlife reserve derives its name from the renowned hummock which legends hold that the Lord Rama od Ramayana fame gave to his brother Lakshmana to keep watch over Lanka. With one of the highest tiger density in India, Bandhavgarh is one of the most popular game reserves for wildlife safaris in India. The park once was home to the white tigers as well but the last of it named Mohan is now stuffed and displayed on whe walls of the royal palace of Rewa. Spread across 450 sq. kms, the reserve is home to over 20 species of mammals and over 250 specoes of birds. Besides tigers, the park is also home to leopards, Golden Jackals, Striped Hyenas, Wild Boar, Sambar, Antelopes, Chinkara and Sloth Bear. Bandhavgarh National Park is one of the few game reserves in India where you could go for the elephant safaris. For tiger spotting, the best time to visit Bandhavgarh National Park is November and April. A wide variety of accommodation is available near the park for the visitors. However one of the most offbeat places to stay here is the tree house located at the periphery of the park itself. The Tree House Hideaway Resort in Bandhavgarh is considered to be one of the finest tree houses in India. 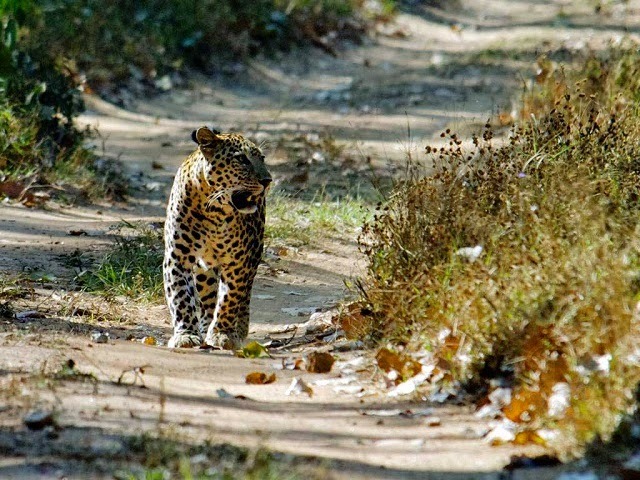 Pench National Park along with Kanha is considered one of those places that inspired Rudyard Kipling to write the Jungle Book. One of the reasons that make it one of the best places in India for wildlife safaris is that despite having good tiger population, abundant wildlife and amazing natural setting, it is one of the lesser visited wildlife sanctuaries in India. Elephant safaris are also allowed in the park. 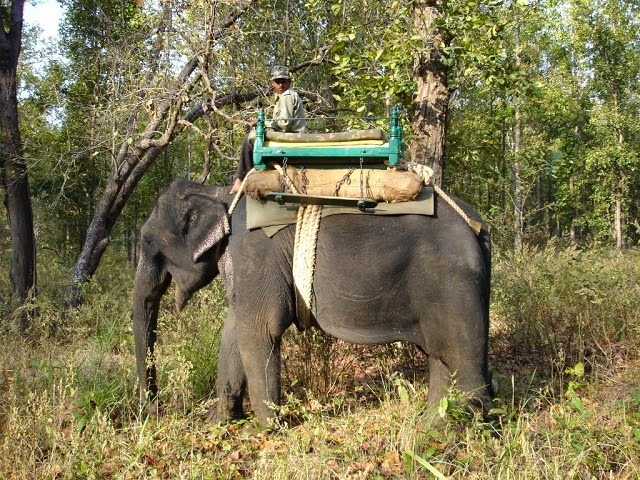 If the mahouts riding their elephant glimpse a tiger they radio the jeep that are allotted to the tourists for jungle safari and then the tourists are transferred on the elephant for a close rendezvous with the king of the jungle. 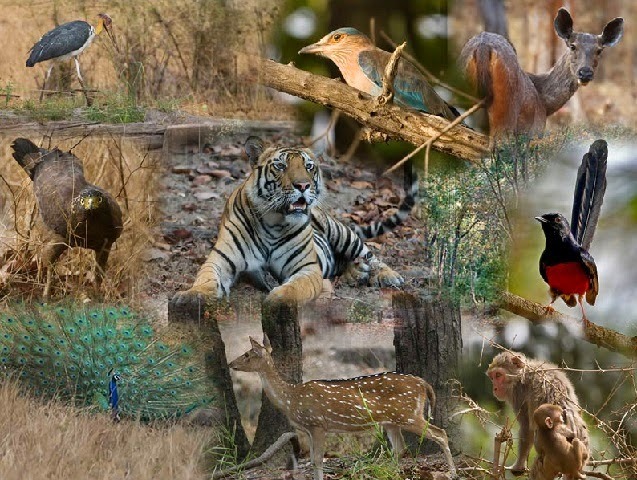 The major attractions of Pench National Park include Hyena, Dhol, Jackals, Chital, Sambar, Gaur, Langur and Macaque. More than 100 bird species are also found within the park making it a good place for birding. One of the best places to stay for safari in Pench National Park is the Baghvan, a luxury jungle lodge by the esteemed Taj Group. Nestled amidst the dense forest and on the edge of a perennial water stream, Taj Baghvan Jungle Safari Lodge offers luxurious accommodation, sumptuous cuisines and impeccable service that makes your wildlife safari experience like a home away from home. The lodge features 12 standalone bungalows with roof top sleep outs that takes you as close to nature as you could wish to. One of the finest and the first national park to be established in India, Corbett National Park is one of the finest places for wildlife safaris in India. Due to its dense vegetation and forests as well as large area and topography, it is very rare that visitors spot a tiger in this reserve yet, its scenic locale, salubrious weather and presence of an abundant wildlife that include deer and wild elephant makes Corbett one of the most visited national parks in India. Jim Corbett National Park is home to over 50 species of mammals, 25 species of reptiles and 580 species of birds making it one of the most versatile wildlife reserves in India. But as it is said, Corbett isn’t just about nature and wildlife, it is the rich heritage and history of the park that makes it one of the most visited national parks in India. Corbett happens to be the oldest national park in Asia with the longest tradition of wildlife conservation. The park remains open to visitors from November till June. The best time to visit is from November till March. The park is connected by rail from Delhi with the nearest railway station being Ramnagar. The park has been divided into 5 tour zone with Dhikala being the most sought after tourism zone. A variety of accommodation options are available near the park to suit the needs and budget of all kind of travelers. One of the few game reserves in India that remains open throughout the year, Periyar National Park is located in the South Indian state of Kerala. 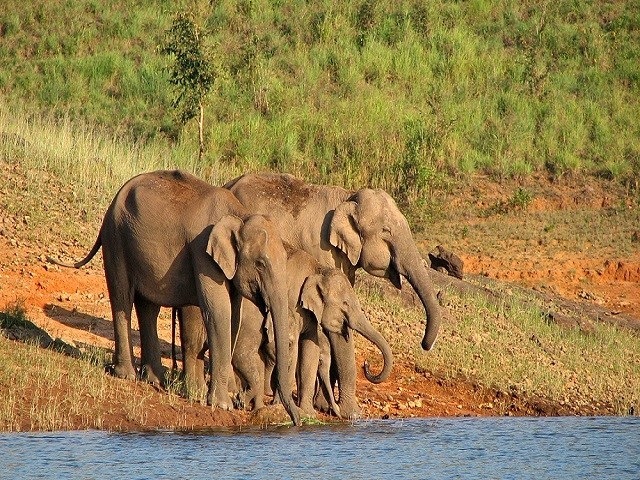 One of the most top tourist places to visit in Kerala, Periyar is both an elephant reserve as well as a tiger reserve. More than 35 species of mammals and over 260 species of birds have been recorded in this wildlife park along with 40 species of reptiles, 40 species of fish and about 160 species of insects making it one of the most biodiverse national parks in India. The major draw of this park is the tiger population that numbers over 40, 4 species of primates, wild pigs, boar, gaur, dole, barking deer and Nilgiri Tahr. The best time to encounter wildlife in the park is from November to March. One could visit the park through boat ride as well as elephant safari. Sunderbans is the largest mangrove forest in the world and is duly recognized as a UNESCO World Heritage Site. 60% of this mangrove forest is located in Bangladesh whereas the remaining portion in the West Bengal has been declared Sunderbans National Park by the government of India. It is both a tiger reserve as well as a biosphere reserve. Sunderbans forest with tiger population of over 400 houses the most number of Royal Bengal Tigers in the world. The tigers of Sunderbans are famous as maneaters and swimmers. The best time to spot tigers in Sunderbans National Park is the month of November and February when these predators are sunbathing by the river banks. Other major residents of the park include fishing cats, wild boars, leopard cats, flying fox, pangolin and macaques. 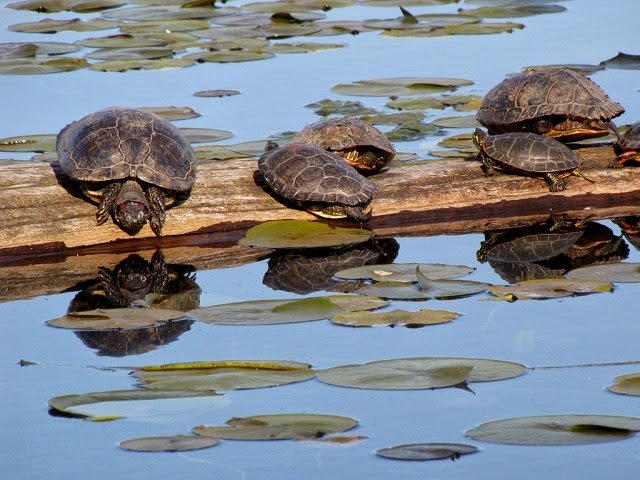 Over 150 species of avifauna has also been recorded in this national park along with over 20 species of reptiles. Endangered species such as saltwater crocodile, Olive Ridley Turtle, Gangetic Dolphin, River Terrapin and Mangrove Horseshoe Crab are also found in this park. The best way to do a wildlife safari in this national park is by river cruise. One of the luxurious ways to explore Sunderbans National Park is aboard MV Paramhansa or the Vivada Cruise. The 4 night package includes accommodation on the cruise ship, food and visits to major places and attractions inside the Sunderbans delta. Fondly referred to as Kipling’s Kanha, this tiger reserve in India offer one of the finest wildlife safari experiences in India which is attributed to its large buffer area. 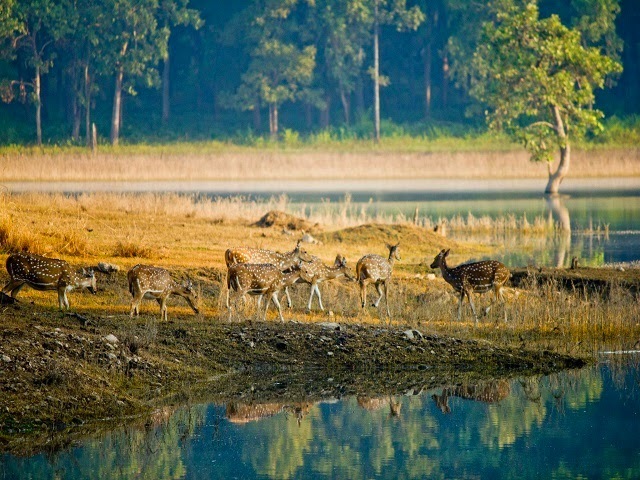 One of the highlights of this wildlife reserve is the thriving population of the swamp deer or the barasingha, the last population of the hard ground subspecies in the world. Although tiger spotting are rare and requires more than one jeep safari in the wild, other common sights include wild dogs, blackbucks, leopards, gaur, sambhar, hyenas, nilgai, Indian fox and barking deer. Reptiles like python and cobra also reside in this forest. Similar to Pench and Bandhavgarh, it is allowed to do the elephant safari in Kanha National Park to have a closer glimpse of the native animals of the park. The park remains close from July till mid October due to arrival of monsoon.